After launching the next-generation Galaxy Camera (read here for more), Samsung has gone ahead and launched two new tablets â€“ ATIV Q and ATIV Tab 3. Both tablets run on the Windows 8 operating system. While one of them is a convertible tablet with the ability to run Android apps, the other one is the world's thinnest Windows 8 tablet (at least that is what the company claims). Here is a look at the specifications. While this tablet runs on the Windows 8 operating system, it can also change mode to run Android 4.2.2 (Jelly Bean) on the same device. Users will not only get access to Android apps (via Google Play), but will also be able to transfer files and share folders & files between the two OS. In addition, the device sports a hinge design that allows one to transform the tablet into four functional modes. You can lay the display flat over the keyboard for a tablet mode; raise the display upright to type like a laptop; float and adjust the display to a comfortable viewing angle or flip the display to place in the stand mode to watch movies with ease. 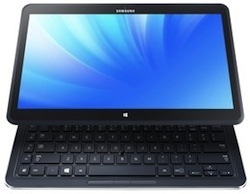 The tablet has a 13.1 inch QHD+ touchscreen display (3200x1800 pixel resolution) and 275 pixels per inch pixel density. It is powered by an Intel Core i5 processor with Intel HD Graphics 4400. The device comes with 4 GB RAM and 128 GB of solid-state drive (SSD) hard disk. It also sports a front-facing camera for video calling, which can also record high definition videos (720p). On the connectivity front, the device has a USB 3.0 port, a USB 2.0 port and a HDMI port. It measures 327mm x 217mm x 13.9mm and weighs 1.29 kg. According to Samsung, the tablet will provide up to nine hours of battery life and will be available in ash black colour. This one has a 10.1 inch HD touchscreen display (1366x768 pixel resolution) and is powered by an Intel ATOM Z2760 processor. Similar to ATIV Q, this one also runs on Windows 8. It comes with 2 GB RAM and 64 GB internal memory. ATIV Tab 3 also has a front-facing camera for video calling and it can also record high definition videos (720p). On the connectivity front, the device has a microUSB 2.0 port, a microHDMI port and a microSD card slot. While the exact measures are not available as of now, it is 8.2 mm thick and weighs 550 gm. At 8.2 mm, the company claims it is the world's thinnest Windows 8 tablet (as thin as a standard smartphone). According to Samsung, the tablet will provide up to 10 hours of battery life and will be available in white colour. It has the ability to run Windows app and programmes, and comes preloaded with Office Home and Student. SideSync: Enables users to switch from PC to an Android-based Samsung smartphone with ease. You can use the PC keyboard to respond to an SMS, view maps on a larger screen, display photos and videos on both devices (the tablet, as well as a Samsung smartphone) and use an ATIV PC to back up and charge mobile devices. Both the tablets come with S-Pen functionality, enabling users to make written updates. The company has also unveiled three new Windows 8 PCs under the ATIV brand. The PCs, called ATIV Book 9 Plus, ATIV Book 9 Lite and ATIV One 5 Style, also come with SideSync technology. Samsung has also introduced a new feature called HomeSync Lite, which transforms the PC hard drive into a personal cloud server. HomeSync Lite allows users to back up their personal files, photos and videos from portable devices to PCs and access those remotely via a mobile device, anytime, anywhere.